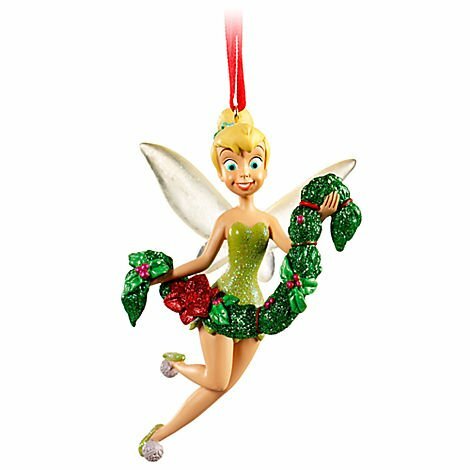 If you are looking for a fairy Christmas then you must definitely look into getting some of these precious Tinkerbell Christmas tree ornaments. They can be used whether you have a specific theme in mind, know someone who happens to love Tinkerbell, or if you are simply looking to add a new piece to your tree ornaments this year. My family always bought a few new things to add to the tree each year to hang among our old decorations. I do not own any of these little figurines myself but was thinking about them at a friend’s when her daughter was watching that Tinkerbell and fairy friend show that comes on the television now-a-days. Especially since I have already mentioned how adorable I find the Tinkerbell Christmas tree toppers, I thought this could be a perfect follow up. My image of Tink is always the classic little pixie in green from the Peter Pan movie. She is showing up with more variation so I chose a few that I thought looked great. I love the first one because it falls right into the classic ball like tree ornament. 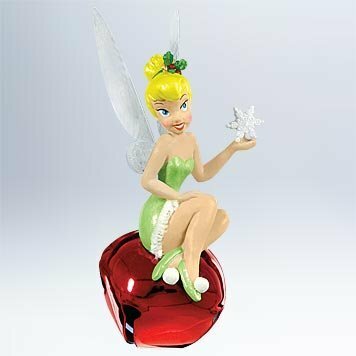 This Tinkerbell decoration has her in her classic green dress sitting on top of a matching forest green Christmas ornament. Look at that smile on her face! This is a great option for anyone looking to add a little something to their tree. The other sitting option is Tink on a red jingle bell. The jingle bell option is a little bit smaller than the first and would look great on a small children’s tree or a miniature table top tree. The other two are free standing Tinkerbell figurines that can hang around your branches or can be hung up on hooks around the house for added decoration. I think they would look great hung on the small hooks along the wall in case they do not fit on your tree or if you want them hung up year round. Of the two I am leaning towards the one with the star because it resembles a personal tree topper. I know that many people collect Tinkerbell Christmas figurines because they enjoy having them on display throughout the year. There is no reason that you could not do that with these decorations if you so choose. Great thing about small ornaments like these is that they can easily be given as gifts to friends and family who have a soft spot for our little pixie friend. Or, like the favorite ornaments we pulled out year after year, they can be packed away and brought out to be admired every Christmas giving y’all something to look forward to.